Seeing the story about Jackie Robinson just never gets old. Again the relationship between Branch Rickey and Jackie Robinson is so impactful. I have so much respect for both Branch Rickey and Jackie Robinson and how they handle all the issues that came with the leap into the color barrier. See the build up to the “shot heard around the world” was awesome. Understanding the circumstances up to the Bobby Thompson home run, made this game and home run just simply put incredible. Up until this time the Dodgers just could not get into the World Series and to lose it all on the one shot or home run. I could really feel for the Brooklyn Dodgers and Brooklyn Dodgers pitcher Ralph Branca. The scene of Ralph Branca face down on the stair in despair is quite moving. I had such a sense of joy when the 1955 Brooklyn Dodgers finally won the World Series. What a great story? The great struggles between Walter O’Malley and both Branch Rickey & Robert Moses were very enlightening. I did not see what the issues were for making Branch Rickey leave the Dodgers and gotta believe the egos were so great that one had to leave. What would of been had Branch Rickey stayed with Dodgers? However, with Robert Moses conflicts, O’Malley seemed to try and work every angle to find a compromise of the land location for a new ball park. Obviously this was the beginning of the end for the Dodgers in Brooklyn. I can say that I do not blame O’Malley for leaving for greener pastures in Los Angeles. Los Angeles gave him everything. Bring the New York Giants along with him to San Francisco was a stroke of genius. 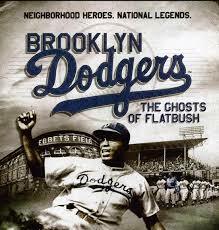 So if you have a chance to watch the “Brooklyn Dodgers Ghosts Of Flatbush” I would say do it. I was certainly woke up to how the Los Angeles Dodgers came to be in located in Chavez Ravine, Los Angeles at Dodger Stadium. Highly recommend watching and learning about the Dodgers in "Brooklyn Dodgers Ghosts Of Flatbush."